San Pancho’s La Patrona Polo & Equestrian Club extends an invitation to enjoy a gourmet experience surrounded by lush greenery, live music and equestrian glamour. The RivieraNayarit is home to a spectacular place that has been quietly positioning itself as one of the favorite spots for visitors to the region: La Patrona Polo &Equestrian Club, located in the charming town of San Pancho. Located within the complex, the Tierra Tropical Culinary and Cultural Center is hosting the 23rd International Gourmet Festival, during which the long-awaited Gourmet Polo Brunch will be held next Sunday, November 19, featuring the culinary creations of Chef Gerardo Vazquez Lugo. This renowned Mexican chef is passionate about artisanal Mexican cooking and will present a unique contemporary proposal—aromatic, flavorful and colorful—that will complement an exceptional Sunday full of Mexican culinary arts and traditions. His restaurant, Nicos, one of the best known in Mexico City, has been a traditional fixture since 1957. During this time it has offered its patrons excellent quality and dining experiences, always supporting Mexico’s small farmers and creating dishes with original ingredients that respect traditional Mexican cuisine. The Gourmet Polo Brunch marks the end of the International Gourmet Festival, which takes place from November 10-19, 2017 and is celebrating 23 years of positioning the Riviera Nayarit, Tepic and Puerto Vallarta at the forefront of the global culinary scene. 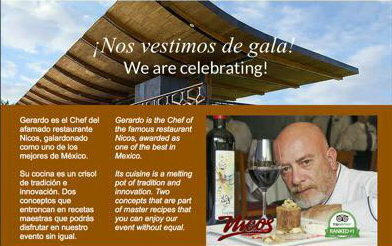 For reservations: reservaciones@tierratropical.com.mx Tel. 322 182 3131. The gastronomic tourism offer is a key asset of the tourism promotion efforts undertaken by the Riviera Nayarit Convention and Visitors Bureau (CVB) and the Bahia de Banderas Hotel and Motel Association (AHMBB), with the support of the Nayarit State Government through its Tourism Promotion Trust (Fiprotur).